never there. And where you are ain't no good unless you can get away from it." "No man with a good car needs to be justified." Most film fans will have a handful of titles in their collection that they cannot view with any degree of objectivity. And so it should be. It signifies when the appreciation of a work of art or entertainment is driven by an emotional response rather than an intellectual one. You can work out why it's a great movie later, but for now it's all about love, and rational analysis has no part of it. But take the next step and you'll quickly find yourself re-categorised from film buff to hopeless obsessive. It's a move that prompts sensible people to shake their heads and ask after the state of your sanity, and for those standing next to you at the bus stop to take a discrete step backwards as you enthuse to a fellow devotee. In the eyes of the so-called normal world you have become a geek. It's a condition that sees people every year dress up as characters from Star Trek and meet to exchange Klingon greetings, or to meet at Portmeirion and re-enact scenes from The Prisoner. It's what prompted those two fans of Withnail & I to visit locations used for the film for one of the extras of the film's last DVD incarnation, and what inspired myself and my own personal Withnail to trudge to the village of Turville in Oxfordshire to photograph each other at the sites at which Went the Day Well was shot. And it's just such a relationship with the 1979 film Wise Blood that led to two evenings of outrageous silliness at a local pub in which my friend, dressed as the film's lead character and sporting a dodgy Tennessee accent, had the landlord on his knees yelling evangelical Hallelujahs as tears of laughter poured down his face. Now if you've never seen Wise Blood – and there's a fair chance you haven't – then you'll probably be wondering just what it is about it that could provoke such a response. Mind you, if you have seen it you'll probably be none the wiser. This is no case of "just see it and you'll get it," as there's a fair chance that you won't. It's a personal thing, one of those times when a film and a character strike such a chord that the response resists all rational explanation. Such is the case with Hazel Motes, a name as burned onto my consciousness as Dracula, Judah Ben-Hur or Hannibal Lector. Hazel visits the local clothing store run by one of the area's few remaining residents, disposes of his uniform and dresses himself in a blue suit and a dark, broad-brimmed hat. 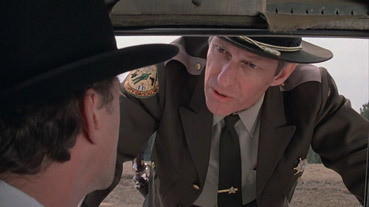 It's a hat that subsequently defines him as strongly as his fiercely held convictions (it's selection is announced by a perfectly timed train horn from the scene that follows), a preacher's hat for a man who detests preachers but who becomes one himself in his public denouncement of the message they seek to spread. The catalyst for his transformation from non-believer to evangelist is Asa Hawks, a street preacher who blinded himself with lime for his faith and who bleats the gospel for donated coins while his daughter Sabbath Lily hands out printed words of salvation, a tract that Hazel calmly tears up and tosses back at her. Something nonetheless clicks between the two, and Hazel sternly follows Sabbath to their next location, pestered all the way by the twitchy Enogh Emery, a friendless motormouth who buzzes around Hazel like a hungry mosquito that will not be batted away. Hazel forcefully denounces Asa's preaching to the passing crowd and proclaims his intention to create a new church, "the church of Truth Without Jesus Christ Crucified," one that will cost nothing to jon and in which "the blind don't see, the lame don't walk and what's dead stays that way." With scant help from the too-eager-to-impress Enogh, he locates the boarding house where Asa and Sabbath are staying and rents an upstairs room for himself. It turns out that Asa is not all he seems, but he appears amusingly convinced that Hazel is following him, while Sabbath has very different designs on this young firebrand. Wise Blood is not by any stretch of the imagination mainstream movie material. Faithfully adapted from Flannery O'Connor's wonderful first novel of the same name** by Fitzgerald bothers Benedict and Michael, whose parents were close friends of the author, it's a project that even with legendary director John Huston on board was unable to attract a single cent of American backing, the sub-one million dollar budget eventually coming from Germany on the back of Huston's reputation. The raw material offers no obvious hook for American studio interest: traditional hurdles are not encountered or crossed, relationships are formed from desire rather than love and fail to provide long-term happiness, and the paths of right and wrong are so intertwined as to be barely distinguishable from each other. Making matters worse that none of the main characters are easily likeable: Motes is a ferocious and narrow-minded obsessive; Hawks a judgemental hypocrite; Sabbath a manipulative harlot; and Enoch a chronically insecure oddball with a shrunken mummy fixation. But as screen characters they are not just interesting but downright fascinating, and herein lies a key part of the film's substantial hook. The material is all there in O'Connor's novel – almost every line of dialogue is lifted straight from the written page – but is brought vividly to life on screen by a cast who have been perfectly matched to their characters, none more so than Hazel Motes himself, played to perfection here by Brad Dourif. Now let's just pause for a moment to consider this hugely talented but criminally underused actor. His (credited) film debut was as Billy Bibbit in Milos Foreman's 1975 One Flew Over the Cuckoo's Nest, a performance so utterly convincing and truthful that at the time of its release I was convinced that he was one of the real psychiatric patients I'd read had been used in the film. When others were talking about Jack Nicholson's performance – which was great, don't get me wrong – I was enthusing about Dourif and predicting a great future for this extraordinary new screen talent. And yet where were the starring roles and great parts that should have subsequently fallen his way? Sure, he's not the most conventional looking of actors, which always seems to an issue for Hollywood, but it's hard to believe there were not major film roles out there for which he would have been a perfect choice (answers on a postcard, please). And yet for the most part Dourif has found himself cast in supporting roles, often in single episodes of long-running TV series and all too frequently as peculiar misfits or borderline psychopaths, culminating in his multi-film stint as the voice of Chucky in the Child's Play series. Probably his most decent and substantial screen role in recent years was as Doc Cochran in the HBO TV series Deadwood. For my money, Wise Blood showcases Dourif at his best and in Hazel Motes provides him with a role perfectly suited to his sharp-angled features, laser-pierce stare and energy-fuelled intensity. Everything about his expression, body language and movements is aggressive-defensive,*** a creature in constant conflict with those around him, not because of what they do but what they believe. 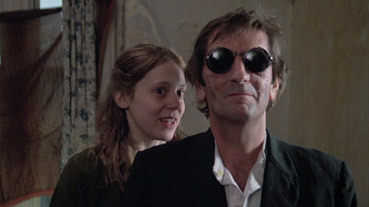 Of course all of the above complaints about the closed road to stardom also go for the prince of American cult character actors, Harry Dean Stanton, who brings his customary earthy authority to the role of Asa Hawks, remaining as expressive as ever even behind the dark glasses, while Amy Wright is a constant joy as Sabbath Lily, hovering beside or behind her father and addressing Hazel with a delicious blend of mischievous amusement and lecherous desire. Completing the quartet is Dan Shor as edgy hanger-on Enoch Emory, another enjoyable performance that failed to land the big roles, save for his turn as Ram in cyberpunk fantasy fave TRON three years later. Providing solid support on the professional side are Mary Nell Santacroce as the boarding house landlady and Ned Beatty as con man Hoover Shoates, who moves in to profit from Motes' public performances and inadvertently helps steer him towards the darker side of obsessive religious belief. The rest of the cast are made up from non-professionals selected from the community in which the film was shot, sometimes playing themselves, which provides its own cluster of delights in the shape of characters that engage precisely because of their offbeat naturalism. All of them register and stick cheerfully in the memory, particularly the silent roadside mechanic or the car salesman and his mouthy young son, although my favourite just has to be the soft-spoken lawman who pulls Hazel over and takes action against his insanely un-roadworthy car – additional pleasure arises from the knowledge that he's played by the district's real sheriff. 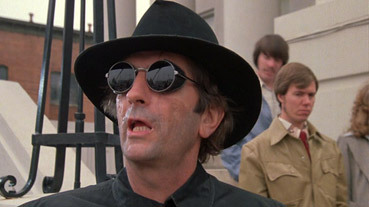 Blackly comic until it's dark final act, a key strength of Wise Blood is that it's attitude to religion remains open to multiple interpretations, the result, perhaps, of a clash between O'Connor's moral Catholicism and Huston's devout atheism. The screenwriters themselves have expressed their conviction that Hazel's initial rejection of Jesus is reversed in the final and extreme acts of devotion to his faith and I'm not about to question this. But coming from Huston's camp, it's hard not to also read in the film both a condemnation of religious extremism – which proves directionless and self-destructive – and a mockery of the fractious nature of modern western religious belief, which has splintered into a myriad of sometimes bizarre sects and sub-religions with their own peculiar takes on God, morality and the hereafter. 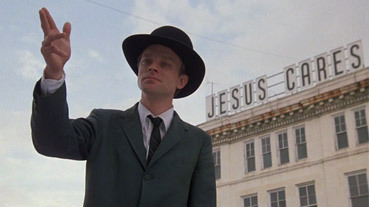 I know I'm talking from a personal perspective here, but I'm aware from research and my own sweet memories of two nights in a bar with perhaps the film's biggest fan – now long since departed and still sorely missed – that I'm not the only one for whom everything in Wise Blood just clicks to perfection. Its joyously off-the-wall characters, superb performances and close adherence to the structure and dialogue of O'Connor's novel make it feel as fresh today as it did back in 1979. The great John Huston (or Jhon Huston as he is named in the child-drawn opening credits) supervises with a largely invisible hand, and in the process allows the glory to fall to his actors, Alex North's easy-going folk and country score and Gerry Fisher's camerawork, beguiling in its long character tracks, facial close-ups and telling two-shots (a couple involving Sabbath and her father are open to almost theological reading). But in marshalling all these elements so harmoniously, Huston, in unobtrusively low-key fashion, creates one of his finest films, and one whose boldness and sense of adventure puts many of his younger contemporaries to shame. You may have heard that Wise Blood is also coming up for a US release from Criterion and be wondering just how Second Sight's UK disc will measure up in terms of picture quality. Well the Criterion disc may still be a couple of months away yet but I'm willing to bet that it will not better Second Sight's transfer by more than a whisker, if at all. Why? Because the PAL transfer here has been sourced from the high definition master restored by Janus Films, the very people who provide Criterion with their film material. In accordance with expectations that come with the Janus logo, this is an excellent transfer from a top class print, boasting fine contrast and naturalistic colour and a sharpness that in no way feels enhanced – the exteriors especially have a rich and filmic quality to them. The pictire is framed 1.78:1 and anamorphically enhanced. The Dolby 2.0 mono soundtrack is clean of noise and does well by both dialogue and the music score, whose clarity and dynamic range are very impressive. Criterion may be promising slightly more in the way of extras, but Second Sight have included four key interviews of substantial collective length that also look to be the meat of Criterion's extra features list. Pleasingly, all four kick off with a warning about included plot spoilers for those new to the film. Lead actor Brad Dourif (16:26) talks by lamplight about his experience on the production, the input of the Fitzgerald family (mother Sally was the film's costume designer), Huston's directing style and attitude to religion, his own philosophy of life, and the way the film appears to be set in no one specific period. His story of how he landed the role of Motes differs from the one told by producer and co-writer Michael Fitzgerald, the suggestion here being that Tommy Lee Jones was the original first choice. Intriguingly he describes the script as reading like the skeleton of O'Connor's novel with all of the poetry removed, but still "so cool." Co-writer Benedict Fitzgerald (23:09) outlines the friendship between his parents and Flannery O'Connor, whose status in the literary community and moral Catholicism he also touches on. He sums up his fondness for Hazel Motes by describing him as "a rebel with a cause, it's just he didn't know what the cause was." The story of the work required to get the film off the ground is particularly interesting, as is the information on Huston (who apparently taught him everything he learned about writing screenplays) and the townsfolk who appear in the supporting roles. Producer and co-writer Michael Fitzgerald (22:12) provides a second perspective and plenty of new information on the long journey from script to completed film, and rather modestly describes the writing process as mere secretarial work, given that the dialogue and plot were taken straight from the novel. He suggests that Dourif was cast right off the bat after they saw his performance in One Flew Over the Cuckoo's Nest, and looks back warmly on a production that saw everyone sharing the same hotel, whose owner regularly lost money at Huston's poker games. Echoing he brother's sentiments, he claims to have learned more from Huston than anyone he's worked with since. Actress Amy Wright (8:35) talks about getting the role of Sabbath Lily, the speed of the shoot, her character, Huston's directing style and the production's lack of traditional role hierarchy. She also speaks highly of the source novel, explaining that everything she needed to create her character was on the written page. 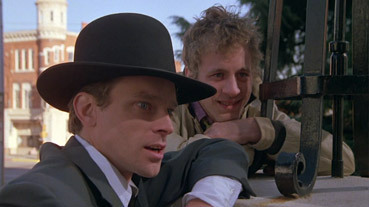 I have many fond memories of Wise Blood and the two evenings of mirth it prompted, and was thrilled to re-watch it after several years and find that it's lost none of its bite and that it hasn't dated a bit. The performances are all terrific – Dourif and Wright are particularly superb – and Huston's subtle handling allows them and O'Connor to shine. Second Sight have done the film proud, with an excellent transfer and a fine collection of interviews. Highly recommended. * A similar note written by me and attached to an object in my workplace many years ago landed me with a reprimand from a manager with no sense of humour who was clearly unfamiliar with the book or film. ** Flannery O'Connor wrote thirty-two short stories and two novels in her career as a writer, work that is very highly regarded and influential in literary circles. Her career was cut short when she died of hereditary lupus, something that will no doubt intrigue followers of House M.D..
*** Dourif even captures the book's lovely description of Motes' awkward posture, described at one point thus: "Haze got up and hung there for a few seconds. He looked as if he were held by a rope caught in the middle of his back and attached to the train ceiling."